Out door Set-up for Airbrush entertainment. 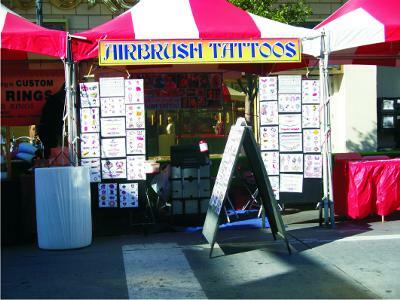 Airbrush Entertainment offers temporary airbrush tattoos for parties, special events and festivals. Our airbrush tattoos are waterproof and will last about a week. We service Seattle, Washington and surrounding cities. We will travel up to about 200 miles. For more information, please contact Trish Beller at 928-846-0707 or go to my website at www.airbrushentertainment.com.